I gave in to Cafe France's invitation to try out their new gourmet sandwiches. Their latest offerings include Mandarin BBQ Beef, Rib Eye Steak, Crispy Shrimp, Hickory Chicken, Oriental Baked Chicken, No Meat plus the Farmer’s Ham, Brie, and Raspberry. All varieties came with crispy potato chips as a siding. It was my first time to taste the Smoked Norwegian Salmon with Lemon Mayo (P 250) and I was not disappointed at all. The thinly-sliced pink salmon was juicy and soft. The Lolla Rosa lettuce and fresh tomato garnishes added a crunch complement I was looking for. Farmer’s Ham, Brie, and Raspberry (P 250) had delicious ham slices. The creamy Brie cheese and sweet raspberry jam complemented the light saltiness of the ham just the way I like it. Hickory Chicken (P 235) is pulled chicken in a luscious barbecue sauce, topped with crunchy alfalfa sprouts. The thickly-shredded chicken meat is tender. I love its sweet and smoky sauce blend! The alfalfa sprouts gives it an added texture. Oriental Baked Chicken (P 210) is finger-licking good! I can taste the soy sauce, ginger, and garlic in its sweet chicken fillet! Crispy Shrimp Sandwich(P 235) is one of my favorites! The crunchy beer batter does an excellent kick at each bite! The honey-mustard sauce complements the crunchy tomato-lettuce salad mix as well. I will surely come back to sink my teeth into Cafe France's other gourmet sandwiches. Special thanks Cafe France and Kathy Kenny for a tummy-filling afternoon activity. 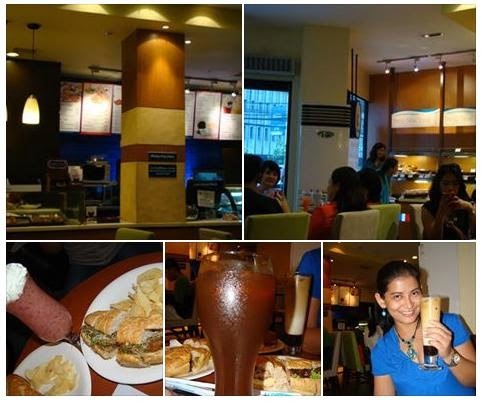 Like CafeFrance on Facebook or follow them on Twitter @CafeFrancePH to know more about their sumptuous French gourmet offerings. Panalo, you should remind me to try this when I'm there for a vacation.